Book Adventures: Lazy Days of Summer GIVEAWAY Hop! Yay! Another giveaway hop! I love these things. This one is brought to you by Colorimetry and I Am a Reader, Not a Writer. To visit the other blogs on the hop, please click on the image to the left. For this hop I'm giving away a hardcover, autographed copy of Ally Carter's Heist Society (Heist Society series book 1) along with a little Heist Society & Gallagher Girl (Ally's other series) key chain, & (added 7/28) a pair of heist-y looking sunglasses! To enter the giveaway please fill in the Rafflecopter form below. Check out my previous post containing the Q&A video from Ally's visit to the Provo Library to learn more about Ally and her books. 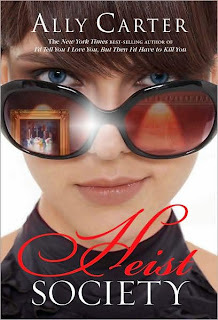 There are currently two Heist Society novels, with a third due Feb. 2013. An original painting by one of the masters, because Katarina's already got the crown jewels! I loved this book! A signed copy would be so great! Thanks for the giveaway. I don't know what I'd heist maybe jewels or something. Click HERE to see my giveaway. You can win either Austenland or Midnight in Austenland by Shannon Hale! Either jewels or just cash! Would love to read this book! Masterpiece artwork....or gold bricks, if I could break into Fort Knox vault. Books....lots of books...and some artwork to liven up the house. Pretty, sparkly jewels. :) Thank you for the giveaway! Eep I'm DYING to read this book!! Thanks so much! I'd probably heist some awesome first edition books! :D Or maybe jewels so I could sell them and buy more books! I've gotta go with jewels!! I would heist book defintely. Check out my giveaway Here I am giving away a copy of Sweet Evil by Wendy Higgins. it would be artwork ;D Thanks for the giveaway! I would heist a Jane Austen Manuscript. I would have to say money or jewelry! I have never thought of heisting anything before. It would have to be something that is non-traceable though. :) It would also have to be worth going to jail for if I'm caught. Some rare super-mega awesome vintage book set! Haha and I'd get Ket to help me with it! I do love money, but I'd probably hit up the museums and get some pretty antiques. Beauty + history can't be beat. I would have to say Gold or Jewels..
Def heist Jewels or paintings! Something from the Library of Congress. There are many Narional Treasures there. Oh maybe some jewels, crown jewels of course only the best! Thanks for the chance at this great giveaway! Good question. I would probably heist chocolate. Books that I can't wait to read! Thanks for the giveaway! I think I'd have to go with jewels! I would so the crown jewels. Thank you. I would heist money or really old editions of books. Diamonds obviously! Or, like, original Shakespeare books maybe. Something cool like that! I wish heisting would include robbing entire bookstores whole. Definitely first editions of my favorite books! Van Gogh's Sunflower painting! I LOVE that! The Crown right from the head of England's dear old queen! Did you say item or items LOL Definitely this book, a cuppa, and the biggest juiciest cake around ;=D Thank you for the fun! LOL! Books, jewels, money, etc. I would have to get some jewelry. Probably ARCs from the publishers. Signed first edition of Gone With The Wind. Loved that book and movie also. It would be for myself and not for sale. Ugh probably original copies of Shakespeare's works (if they even exist). Either that or Van Gogh's Starry Night! Uncut diamonds! Thanks for the giveaway!